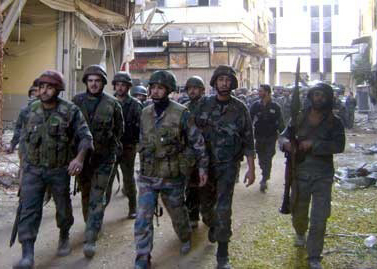 JNN 26 Oct 2014 DAMASCUS, – The Syrian army on Thursday recaptured the vast majority of a strategic town in central province of Hama after battles with the Terrorist Groups, Syria’s national TV reported. The Syrian government forces wrested back control over the vast majority of the key town of Mork in the northern countryside of Hama, as part of the military’s ongoing offensive to dislodge the terrorists from Hama’s northern countryside, said the TV report. It added that the Syrian troops are haunting down the remnants of the terrorists in the town. A military officer told Jafria News on condition of anonymity that the military operation in the countryside of Hama is aimed at protecting the city of Hama and the town of Muhardeh, where an important power station is located. The operation would also prevent the “terrorists” from expanding their presence to the Syrian coast or the international road that connects the southern part of Syria with the coastal and northern region. Meanwhile, the pan-Arab al-Mayadeen TV said the Syrian troops fully recaptured Mork, while the oppositional Syrian Observatory for Human Rights, a watchdog group, said the town witnessed violent clashes over the past hours. The pro-government Sham FM radio cited sources from the town as saying that the Terrorist in Mork sent distress calls to their comrades in nearby areas to back them up against the crushing offensive of the Syrian army. The al-Qaida-linked Nusra Front and other likeminded groups captured the town last February after capturing checkpoints at its entrances. Since then, the Syrian air force struck the town several times before unleashing a wide-scale offensive in the northern countryside of Hama in recent months. This entry was posted in Middle East and tagged Hama, northern countryside, syrian troops, The Syrian army. Bookmark the permalink.